An upscale, quality top, worn alone, with a cardigan, dressed up with jewelry and/or a scarf or dressed down for a casual event, the fashion tee is a versatile addition to a woman’s wardrobe. It is making an appearance this fall in tighter, shape-hugging silhouettes and soft, luxurious fabrics. Embellished with a monochromatic tone-on-tone logo, it can be an elegant display for promotional embroidery. Colors, popular this season, excellent for this tone-on-tone treatment include camel, brown, black, powder blue, charcoal, steel gray, red and white. Matched with black, navy or brown gabardine cuffed pants, available with a slightly flared pant and narrow pin stripe pattern, the result is a professional look that is comfortable and quite chic. 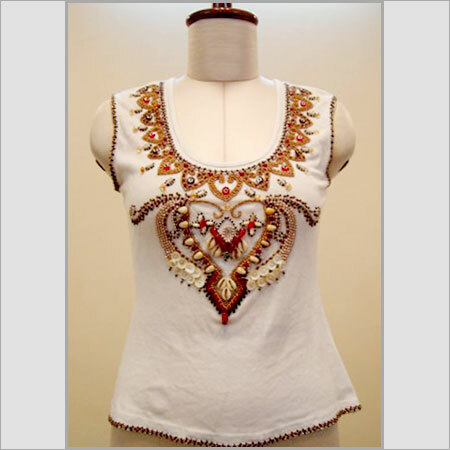 Left Chest – Left chest placement on a woman’s fashion tee is especially important with styles moving toward tighter-fitting, shorter designs. A logo should be applied 6″ down from the shoulder seam (measuring from the shoulder seam to the bottom of the design) and placed at a point midway between the center front of the garment and the armhole seam. Care should be taken that the design does not extend under the armpit or too low on the chest. Also, make sure that the design is small enough to fit comfortably in the space provided. Pinning a cutout of the design on a sample garment is a good way to check for proper size and placement. Center Front – A recent trend in design placement for women’s business apparel is center front on the bodice, approximately where the pendant of a necklace would fall. This works extremely well on a fashion tee with a higher neckline, such as a boatneck, crew or high scoop. A coordinating cardigan or vest creates a finished look that also highlights the embroidered design. Fabrics that convey a professional image and offer a good working canvas for embroidery are the best choice for women’s promotional tees. Ring spun cotton, interlock and brushed rib take well to embroidery. Other, somewhat more elegant fabrics such as wool/silk blends, polyester viscose, 100% polyester (a version that feels like cashmere), 100% silk, nylon/rayon blends, micro fibers and polyester spandex are also available. Keep in mind that these fabrics may require different design considerations or stitch density levels for the embroidery process. If, when a design is sewn out, the fabric pulls and puckers, there’s a good chance the density of the stitching is too heavy. If the fabric is showing through, the stitch density is most likely too low. Letting your digitizer know the type of fabric to be embroidered and specifying the type of thread preferred will help them to provide you with a digitized tape that sews out well and creates a quality image. With its vibrant colors and high sheen, an elegant choice of thread for the fashion tee is rayon. A cooler temperature with color-safe bleach will need to be used for items embroidered with rayon thread. Letter size is an important consideration when creating a design for the embroidery process. This is especially true when embroidering on women’s apparel where the overall size of the design may need to be reduced. Serif fonts are not advisable for small text. For best results, use capitalized letters in a sans serif font such as Arial (for text under ½”). (Your digitizer can advise you if the text in your design will sew out well at its original size.) Most fabrics used in fashion tees require a minimum text size of 3/16″ for an embroidered design. However, nylon or stretchy fabrics require a minimum of ¼”. Women are being seen in greater numbers on the golf course as well as in corporate positions previously occupied primarily by men. One way to address this shift and increase your sales is to provide coordinating styles for promotional events that are gender based. A man’s charcoal gray polo shirt with white stripes, for example, could be coordinated with a woman’s fashion tee and coordinating sweater or vest. A white scoop or boatneck tee, with a logo placed at the center-front “pendant” location, and a charcoal gray cardigan or vest would be a stylish counterpart to the man’s polo shirt.